Christine Conrad Cazes lives with her husband and wire fox terrier in Thornwood, Westchester County, New York. A teacher for more than 20 years, she continues to instruct elementary school children in reading and writing for the Mount Pleasant Central School District. The author enjoys family gatherings and activities, and loves traveling during holiday breaks. 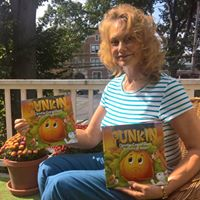 PUNKIN is her first children's book about the magical journey of a young pumpkin which received The Pinnacle Book Achievement Award in the category of Children's Interest. Her second book, GEM'S GIFT, is an action-packed story that continues the Westorchid series. It is about a young squirrel who learns the power of love. Her next book features a family of swans!